Notes: chrysotile commonly occurs as soft friable fibers. Asbestiform amphibole may also occur as soft friable fibers but some varieties such as amosite are commonly straighter. All forms of asbestos are fibrillar in that they are composed of fibers with widths less than 1 micrometer that occur in bundles and have very long lengths. Asbestos with particularly fine fibers is also referred to as "amianthus". Amphiboles such as tremolite have a crystal structure containing strongly bonded ribbonlike silicate anion polymers that extend the length of the crystal. Serpentine (chrysotile) has a sheetlike silicate anion which is curved and which rolls up like a carpet to form the fiber. Persons with significant exposure to asbestos are at risk for developing various types of pleural (lining of the lungs) abnormalities. These abnormalities include pleural plaques, pleural thickening, pleural calcification, and pleural mesothelioma. Mesothelioma is a rare cancer which may affect the lining of the lungs (pleura) or the abdominal contents (peritoneum). 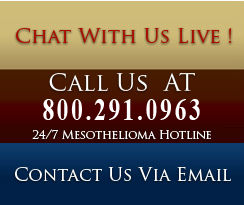 Most mesotheliomas are caused by exposure to asbestos.